(9:30 pm EDT) – The baptism of Norwegian Bliss on Wednesday in Seattle Harbor was a true team effort. While radio personality Elvis Duran had the honor of being the godfather of the new ship, his entire Morning Show crew engaged in various spaces around the ship, housing passengers and guests on board for the big event. 1; letter by letter – waited. Duran pressed the last button and sent the bottle into the Bliss hull, successfully naming the ship. "It's a tradition to sacrifice a nice bottle of defenseless champagne," joked Duran. "Can not we use water?" The ceremony, which took place at the Ship Bliss Theater but was ship-wide broadcast, was held in front of media, travel agents and VIPs including Alaska Governor William Walker. 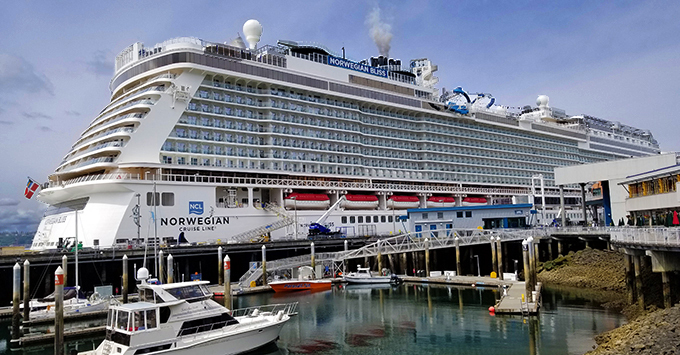 Norwegian Bliss will spend his summer vacation in Seattle sailing to Alaska. Breaking the bottle was the culmination of a celebration, the video shout outs of famous Duran buddies, energetic performances from two of Bliss's production shows, Havana and Jersey Boys, and cruise line executives, thank you all, the one played role in Bliss start. Even Pitbull, the godfather of Norwegian Escape, vowed by video to wish Duran and Norwegians. "Congratulations on being the godfather of bliss," the music sensation said before signing off with his signature "Dale." Cruise director Silas Cook welcomed Duran, who expressed his enthusiasm for his sponsorship, to open the festivities. 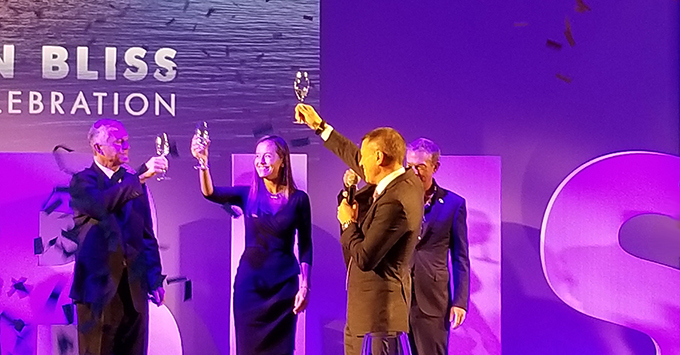 Norwegian Cruise Line Holdings President and CEO Frank Del Rio had a cargo list of people to thank, but he gave special recognition to the 33,000 crew members of the company's three brands: Norwegian, Oceania Cruises and Regent Seven Seas Cruises. 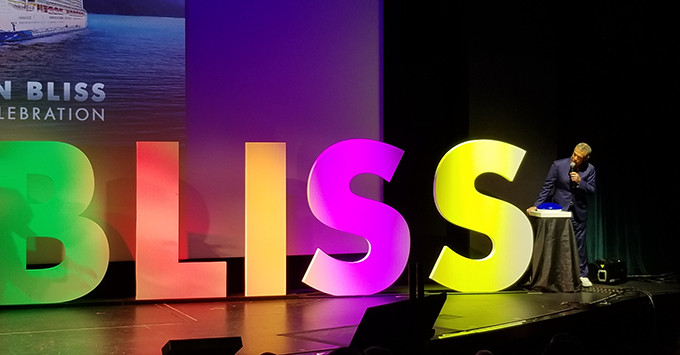 Del Rio also said Bliss was the perfect vessel for scenic Alaska cruise, with its 20,000-square-foot Observation Lounge – complete with floor-to-ceiling windows – and the Horizon Lounge in the ship's harbor. "We believe we have set a new and higher standard for the brand and the industry as a whole," said Del Rio. Duran. "I can not tell you how happy we were to convince Elvis and his team to be godparents of this ship," he said. He also thanked artist Wyland, who created the ship's livery showing life-size images of whales and other marine animals. Wyland also spoke and said, "It's not a big deal. Actually, it's a big deal, I see it as a floating canvas." 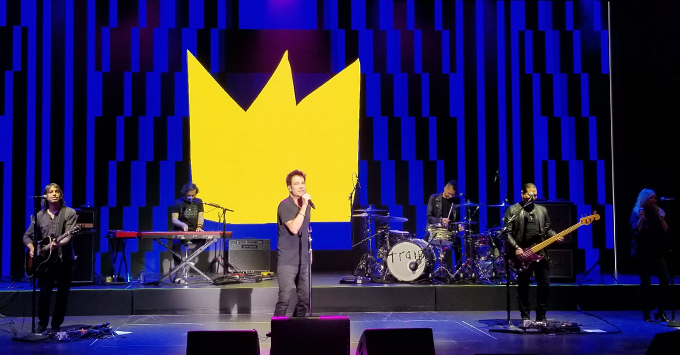 With the real name of the ship, Norwegian surprised the guests with a rock concert by the band Train. Passengers sang hits like "Drops of Jupiter" and "Hey Soul Sister" as they celebrated the newly baptized ship. Lead singer Patrick Monahan congratulated Norwegians and said the band loves the ships of the cruise line and likes to play on them. Earlier this morning, Tom Norwalk, Visit Seattle's President and CEO, spoke to Norwegian executives and gathered media in the ship's Spice H2O lounge area and thanked the Norwegians for making Seattle the home port of Bliss. Afterwards, two parachutists dropped out of a plane, and colored traces of smoke slid across the bright blue sky. With Norwegian bliss flags they landed in the waters of Elliott Bay, where the ship is docked. A few minutes later, Stuart arrived at Spice H2O, wore skydiving gear and joked that he could not resist the temptation of the beautiful day and the new ship. Stuart thanks Norwalk and Seattle for their partnership, and has handed over a huge $ 10,000 check to benefit the young Northwest Tap Connection dancers. Norwegian Bliss, carrying 4,004 passengers, is the company's third ship in the company's Breakaway Plus class, followed by fleet members Norwegian Escape and Joy sailing in Asia. Norwegian Encore debuts next year. Stuart called the ship class the most successful in the history of the company. Norwegian Bliss, the 16th ship of the Norwegian fleet, debuted in Germany and sailed with a transatlantic to New York City. It became the largest cruise ship ever to sail on the way to the West Coast through the new locks of the Panama Canal. After Bliss & # 39; Alaska routes have ended, it will move to Miami, where it will sail regular Caribbean routes.